I have some lemon thyme growing in the garden, but unashamedly I actually used dried thyme in this risotto as I was not prepared to go back outside and get drenched again from the cold pouring rain. I think I’ve actually got a cold coming on. I’ve been sneezing all day. I found the natural creaminess of the parsnips quite rich in this risotto, so no need for dairy cream or cheese. However D had other ideas. He pointed out that he had picked up log of goats cheese which was in the fridge and requested that I top his risotto with a slice. So for those of you who are inclined like him, you are most welcome to do so too, in which case for 4 people you would require 100g goats cheese. I was happy with my plate the way it was, garnished aplenty with the witchy finger parsnip crisps. The recipe below makes a large quantity. I made the extra portions as I wanted to make some arancini with the remaining risotto. Arancini or arancine derived from the Italian word for Oranges are risotto balls coated in breadcrumbs, then deep fried. Sometimes they have mozzarella cheese inside, sometimes vegetables. If the quantity of the risotto is too much for your needs, you are most welcome to half the recipe if serving 2 hungry people. Wash the parsnips and peel. Take potato peeler and shave thin layers of parsnip from root and place into a bowl. Drizzle with the olive oil and toss parsnip shavings, making sure that all surfaces are lightly covered with the oil. Place parsnip shavings onto a non-stick baking sheet in a single layer and put into a pre-heated oven. Bake for about 10 minutes, checking and turning every few minutes. When light brown and crispy, take out of oven and blot on kitchen paper. Bake in oven to gas mark 4 for 4 minutes, then flip the crisps over and bake for a further 4 minutes or until golden. Remove from the oven, season with salt and set aside to cool. Heat the oil in a deep heavy based pan. Add the shallots and sauté until softened. Add the rice and stir until well coated. Increase the heat, add the grated parsnip, thyme and stir well. Then stir in a large ladleful of hot stock. Cook over moderate heat, stirring every few minutes and adding more stock as it is absorbed. Season to taste. Continue adding stock (or boiling water if that runs out) until the grains of the rice taste creamy. Serve immediately topped with goats cheese if using and garnishing of parsnip crisps. Looks great! And that's a wonderful idea to make extra for arancini - they are my favorite! Oooh, are you going to post the Arancini tomorrow? I love those in restaurants but have never made my own - I especially love them with melted mozzarella in the middle. I've never had risotto! I see it on TV all the time, and it looks yummy. I have to admit I am scared to make it, it looks like it would be difficult. Thanks Miss Meat and Potatoes. Hopefully I wil. No promises. So you will have to forgive me if I don't. I am sure an Italian Mama would criticise my risotto for not being very good. But my advise to you is - try it. YOu won't get it right the first time, but if you don't begin now, you'll never get better. Lots of TLC and stirring. I don't think I've had parsnips in my life, and after getting a couple from my co-op this week, I was wondering what to do with them. And here you have two lovely-sounding parsnip recipes in one week! I'll definitely try this- sounds yummy! Lovely, lovely. I like the witchy fingers very much. I hope you beat that cold before it advances. I was a little late being intro'd to parsnips too. I used to dislike their sweetness, now I don't mind indulging. esp winter time. Please do try the parsnips crips! I hope I besa tthe cold too. Can't decide between hot choc. or a lemon drink?! Looks like the perfect remedy, sans goat cheese. Feel better. Both the risotto and the crisps sound delicious. Do hope that cold doesn't come to much. It took me a month to get rid of mine. Ooh I hope to beat it. The weather is just so horrid at the morning, that my little nose is dripping non-stop. Anything with goat cheese on top sounds good to me! I do, however, have some experience making risotto, and am enthralled with the idea of those crisps! Since I seldom follow recipes to the letter anyway, I am going to have to try out this dish in my own fashion. Stay warm and dry, and I hope you feel better soon. Snow is predicted tonight in my little corner of the world (uggh - already?). This seems like a perfectly warming dish combat the elements outside. Good risotto, it will make great arancini. Be careful if you go to Italy, the real arancini usually have meat inside. Hey Mango! I LOVE this idea so much! I love parsnips, and I think they dont get the appreciation they deserve! Thanks for this recipe! Love the witchy parsnip fingers))). Sorry you have a cold though. Get well soon. Lovely to hear from you Patricia. Do hope you enjoy the crisp, they are delightful. Look forward to seeing your version. Have a good weekend. I am feeling much better today. The sneezing has stopped for now. Certainly good praise from you. When I am in Italy, I wil get my guniea pig (D) to test arancini first, before I tuck into them myself. Your right parsnips do not get the appreciation they deserve! But with winter coming now, its a good time to experiment with it. this sounds so good. 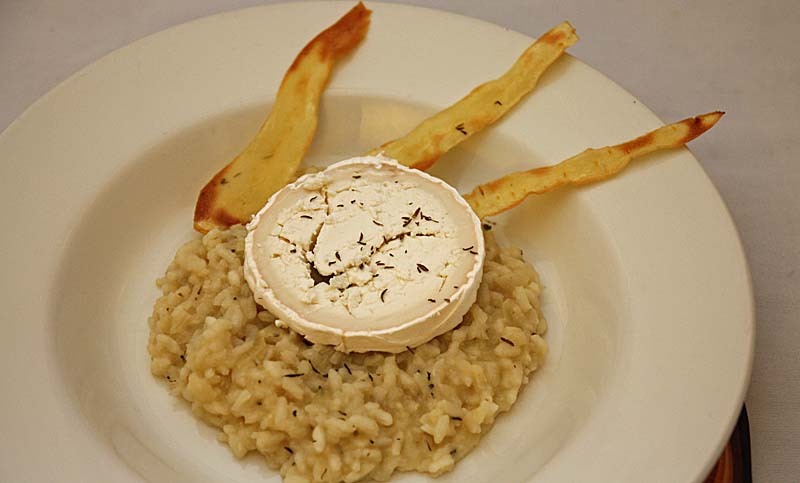 love the pairing of parsnips and risotto...thanks for sharing. The risott sounds great and I am with D- cheese makes everything better! Aren't risotto balls just plain comfort food. I just love them. Than you so much blackbookdiaries. I will let D know too. Risotto balls are comfort food for sure. Firstly for your comment and secondly, for becoming a follower. I really do appreciate it and am always, always humbled when a fellow reader decided s/he likes my blog enough to support it this way. Thank you - means a lot.